YOU MUST BE ABLE TO SIGN FOR THE ITEM. Parts starting with CICM OR CM indicate a master Cylinder. Parts starting with CICS OR CO indicate a slave Cylinder. SO AS TO RECEIVE THE CORRECT ITEM !! When your in the middle of nowhere on a 38o slope, edging over the rock on the left and the wash on the right, you need to know that the clutch is engineered specifically for the unique demands of 4x4 applications. High Capacity Cover Assembly – Higher Torque capacity is achieved by the use of components designed to provide the strength, thermal properties and durability required to increase torque capacity and reduce slipping over a wider temperature range. Spheroidal Graphite Pressure Plate Casting - Sometimes referred to as Anti Burst, dartel or nodular iron, this material provides approximately four times the burst strength of a standard cover assembly pressure plate. 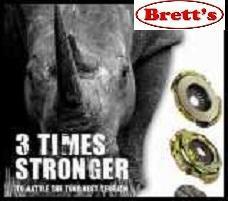 This increased strength not only extends the life of the casting but combined with its improved heat dissipation, allows the clutch to run cooler in extreme situations. Off Road Clutch Plate – Engineered specifically for the unique environment this design includes features unavailable elsewhere. The combined effect of the High Capacity Cover Assembly with Spheroidal Graphite Casting and the Off Road Clutch Plate provides a rugged, strong clutch system that retains the characteristics required for driver control and comfort. reliable is the term which best describes the CI standard replacement kits. CI for specific field applications within the Australian and New Zealand market place. 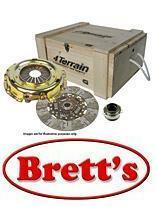 we are well placed to provide Clutch Kits best suited to your region. In fact, in many cases we were the Manufacturer of the Original Equipment part. GKA605 1000 PC ALUMINIUM BLIND RIVETS ASSORTMENT SHORT MEDIUM LONG GRAB KIT SET ASSORT ASSORTMENT 61047 61047 - 1000 PC RIVET SET Rust proof aluminum heads with steel shanks. S 250 of each size - 1/8" x 1/4", 1/8" x 5/16", 1/8" x 3/8", 1/8" x5/8"
© 2011-2016 CLUTCHS / PBR CLUTCH All rights reserved.